Demba Ba is a French-born Senegalese footballer who plays as a striker for Newcastle United in the Premier League, and for the Senegal national team. Ba was born in Sèvres, Hauts-de-Seine, and was the sixth child of seven. He grew up in Saint-Valery-en-Caux, Seine-Maritime. He joined a youth club in Montgaillard in 1992, he played for Port Autonome du Havre between 1998 and 2000, and then for Frileuse between 2000 and 2001. In 2001 his family moved to Châtillon and Ba played for Montrouge. He played there until 2004, at which point he decided to concentrate on his football. He had trials with Olympique Lyonnais and then with AJ Auxerre, both of which were unsuccessful. He then left France to take part in trials at Watford and Barnsley, and was offered a one year deal at Watford. After Watford manager Ray Lewington was sacked in 2005, Ba found that he was not in the first team plans of Aidy Boothroyd, and left the club in March 2005. Ba signed with Alain Michel because they were both moving to Rouen on a one year contract, and Ba enjoyed a highly successful season with the club. Mouscron beat off competition from numerous other clubs to win Ba's signature in 2006. Scoring in each of his first three games, he then picked up fractures in his tibia and fibula, and out of action between August 2006 and April 2007. Following his eight month recovery period he scored seven goals in nine games, and picked up his first international cap. On 29 August 2007, he moved to 1899 Hoffenheim for €3 million. Ba was an integral part of Hoffenheim's promotion to the Bundesliga and their successful first season in the Bundesliga, where they finished seventh after leading during the Christmas break. In that season he scored 14 goals, only missing one game all season. These goals included a hat-trick in a 3–3 game against Stuttgart on 24 February 2009. 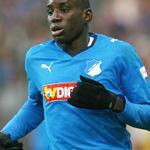 In all competitions Ba scored 40 goals in 103 appearances for TSG 1899 Hoffenheim. In July 2009, he was due to move to VfB Stuttgart, but the move fell through after he failed a medical. In December of that year Ba extended his contract at Hoffenheim to 2013. After signing a new contract, Ba went on to score five goals this season due to injuries and linked with other clubs. During mid season of season, Ba was linked with English clubs. Stoke City made a £5.9 million bid for Ba but the deal was off after Ba failed his medical. Stoke City manager Tony Pulis expressed disappointment over Ba not joining Stoke. Following his move to West Ham, Hoffenheim have insisted they made the right decision to let Ba leave in January. In January 2011, Ba refused to travel to Hoffenheim's training camp as he wanted to move to West Ham United. Hoffenheim announced that Ba would be punished. However, Ba claimed that Hoffenheim had assured him that he would be allowed to leave the club under the current conditions. In January 2011 a proposed move to Stoke City fell through after Ba failed a medical. He completed his move to West Ham on 28 January, signing a three-year deal that would take him until June 2014. The transfer fee was undisclosed but was dependent upon Ba's appearances for West Ham. Ba made his West Ham and Premier League debut on 6 February coming on as a 75th minute substitute for Robbie Keane in a 1–0 home defeat by Birmingham City. His first West Ham goals came on 12 February when Ba, making his full debut, scored twice for West Ham in a 3–3 draw against West Bromwich Albion. Ba scored two goals against Wigan Athletic on 15 May 2011, giving West Ham a 2–0 lead at half-time. West Ham lost 3–2 and were relegated from the Premier League. He finished as West Ham's top scorer in the Premier League with seven goals from twelve games. He however left at the end of the season due to a release clause in his contract letting him go for free if West Ham were relegated. On 17 June 2011, Ba signed for Newcastle United on a three-year deal. He made his Newcastle debut at home against Arsenal on 13 August 2011. This game resulted in 0–0 draw. Ba had a slow start to his Newcastle career, rumours surfaced that this was affected by his observance of the holy Islamic month of Ramadan which requires fasting during daylight hours. He scored his first goals for Newcastle on 24 September 2011 with a hat-trick against Blackburn Rovers in a 3–1 win. He scored in Newcastle's two consecutive games against Wolverhampton Wanderers and Tottenham Hotspur before he scored his second club hat-trick in their 3–1 away win at Stoke City. The result maintained Newcastle's unbeaten start to the league season to 11 games and took them to third place in the Premier League, six points behind leaders Manchester City and just one point behind reigning champions Manchester United. His next goal for Newcastle came on 26 November against Manchester United at Old Trafford after Newcastle were awarded a controversial penalty for a challenge on Hatem Ben Arfa in which Rio Ferdinand appeared to have gotten the ball. Ba scored the penalty and Newcastle went on to draw the game 1–1. Ba then scored another two goals in Newcastle's next away game against Norwich City, even though Ba's impressive performance was still dampened by the fact that Newcastle lost the game 4–2 after they struggled to cope with the height and power of Norwich's attacking players. Ba scored his 12th and 13th goal for the club during their 3–2 defeat to West Bromwich Albion at home, and by that kept on his impressive goal spree in the Premier League. On 23 December 2011, Ba was picked in ESPN.com's Premier League Best XI for the first half of the season. Ba has played a total of ten games for Senegal, scoring three goals. He scored on his debut against Tanzania, in June 2007.